But I digress. 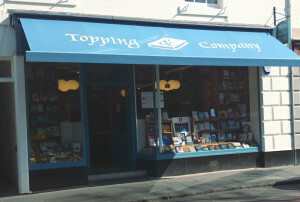 Toppings is on a side street in the town centre and is an attactive double-fronted unit that looks the perfect home for a bookshop. 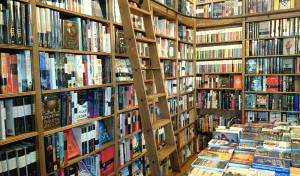 Inside, there are yards and yards – around a mile I believe – of beautiful oak bookshelves stretching up to the ceiling and tantalising away to the back fo the shop and around the corner. These shelves have gorgeous wooden library ladders on rails to enable staff and customers reach books on the uppermost shelves and it’s all very classy. As a bookseller, I probably spent a little longer admiring their shelving that most customers do… but if you go to Toppings, you’ll see what I mean. 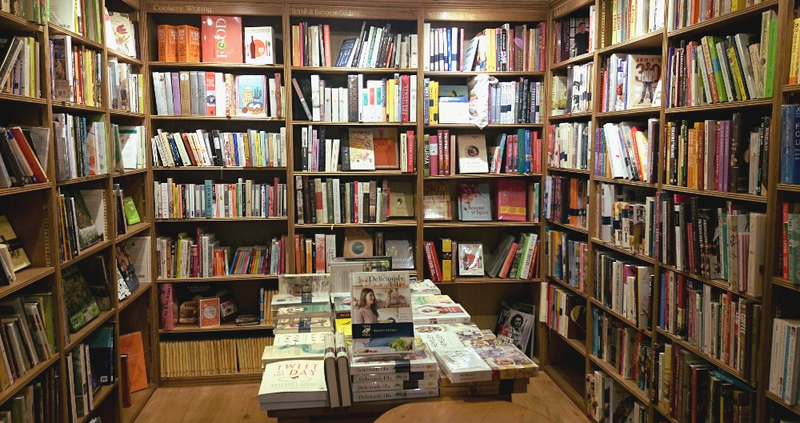 As in their Bath shop, the range is extensive but still carefully selected, with plenty of backlist and midlist titles as well as new releases. Authors don’t just have their latest on the shelves there’s plenty of their older titles to choose from and where gems that you didn’t know existed can be found. Smaller publishers are well-represented as well as the behemoths. And of course, as with their other shops, there are those tables of first editions, many signed, with their pristine dustwrappers protected by (removable) cellophane that makes them glint and shine in the lighting, attracting the magpie customer. I’m one of those magpies and one of the books I came away with a signed copy of poet Wendy Cope’s new collection of prose; reviews, essays, memoir and the like. I have to confess that so far I’ve only read her piece on a lifetime of listening to The Archers but it’s going on my bedside table in autumn so that I can dip into each evening before sleepytime. On the subject of The Archers, I share her pain re the demise of poor Nigel when he plummeted from the Lower Loxley roof. Like Wendy, I considered boycotting but unlike her I didn’t have the moral fibre to carry it through. The piece is dated 2011 though so maybe she’s come back to the fold since then. Wandering around with my long list of possible purchases, a lovely man asked if I would like a cup of tea and I settled myself in a very comfy armchair while he assembled the necessary. Frankly, I’d have been perfectly happy with a mug but he produced a tiny tray with teapot, milk jug and cup and saucer and placed it on the table at my elbow. I loved browsing my pile with my cuppa and it’s an excellent sales technique because I know that it lulled me into buying more books – they’re canny you know. It’s lovely to feel appreciated and a little cossetted. 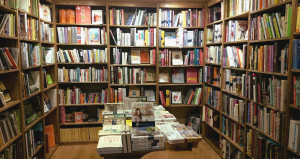 If I’m in an independent bookshop I always try to buy a book, sharing the love and all that, but it’s the mark of a truly great bookshop to see a fellow bookseller with all their trade accounts and publishers’ freebies, leaving with a carrier bag of purchases that they didn’t know they needed. Our trip was a few months ago – it’s taken ages to write up my notes – and the books have been dispersed amongst our bookshelves by now so I can’t tell you exactly what we bought but between the three of us we must have come away with two or three books each. If you’re in St Andrews, do go to Toppings as well as J & G Innes – it’s a fine addition to the town. And if you’re even vaguely in the vicinity of St Andrews, do consider making a trip there. 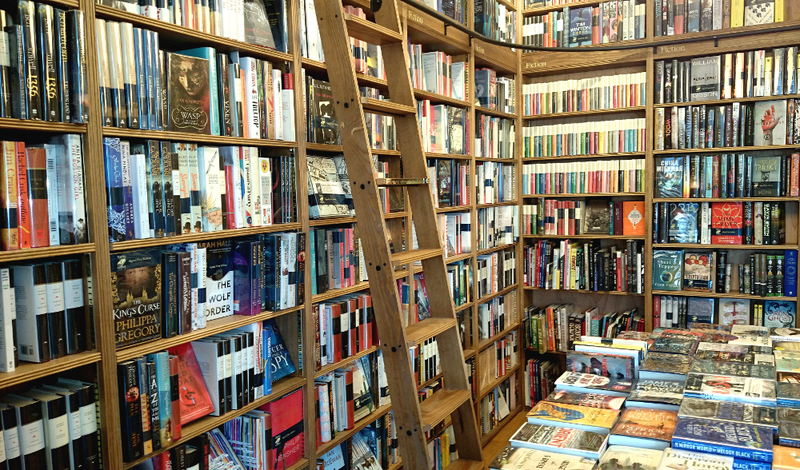 Or in Scotland for that matter – I fully expect to see this shop winning all sorts of Scottish bookshop awards soon. This entry was posted in Bookshops and tagged bookshop, Scotland, Scottish bookshops, Toppings, Wendy Cope. Bookmark the permalink.